Posted by admin in activity reports, eruptions, Eyjafjöll, Iceland. Eyjafjallajökull from the Hvolsvelli webcam, 20 April 2010 at 08:20 GMT. Yesterday the Icelandic Met Office (IMO) bulletin on Eyjafjallajökull reported that seismic signals indicated that lava flow might be beginning and that the ash-producing phase of the eruption was coming to an end. A change in eruptive style from ash-producing to lava-producing could be under way, Icelandic scientists have suggested. However, reports of ‘a new ash cloud heading into British airspace’ have meant that plans for a partial resumption of flights from UK airports have been scaled back. 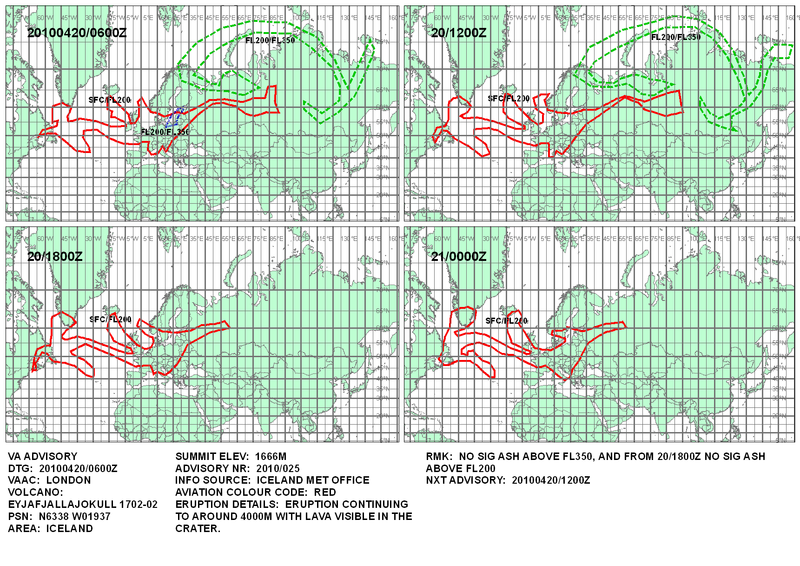 The latest Volcanic Ash Advisory from London VAAC, issued at 0600Z today, reports that the eruption plume is reaching 4000 m altitude and lava is visible in the crater, and remarks that there is no significant ash above FL350 (35,000 feet/10,600 metres altitude), and that from 1800Z this evening no significant ash is forecast above FL200 (20,000 feet/6,000 metres altitude). The accompanying maps show a very wide distribution of ash across European and North Atlantic airspace. It’s clear that no easing of the flight bans affecting much of Europe can be expected before this evening at the earliest. The continuing restrictions on air traffic are highly disruptive and very expensive, and unsurprisingly there are increasing calls for a more ‘measured’ approach, particularly from the affected airlines. Dr Klemetti has more on this at Eruptions, and Chris Rowan has some relevant observations at Highly Allocthonous. ditto sugiarno – that image says it all. 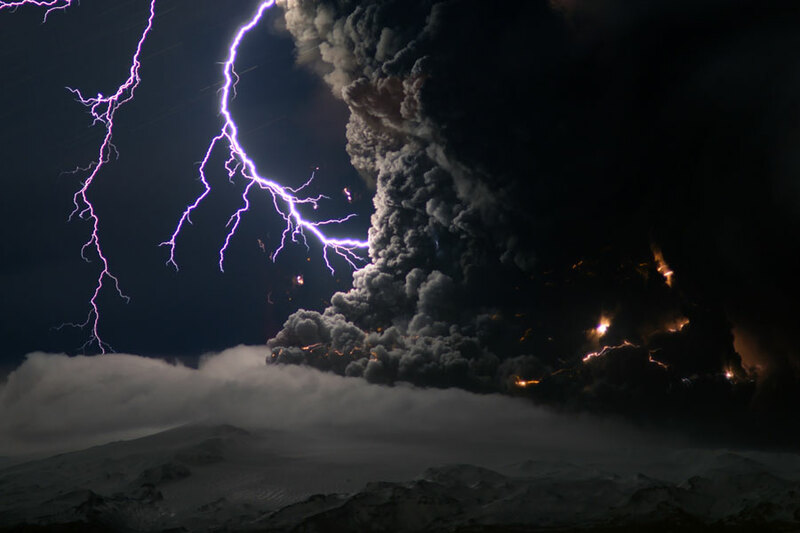 Cause of the eruption: Iceland’s banks angered the Norse gods. Similar to Hawai’i. Very similar. You’ve got to fly under it then! FL200 is certainly below your average FL310 to FL350 airspace occupied by commercial flights. The problem is flying between the affected airspace agl to FL200 and the variable ash cloud patterns due to wind velocity. I don’t have the British weather report in hand. Will take a look at the latest METAR asap. I drilled the first steam wells in Soufriere St Lucia, 1975-76. It certainly gave us some idea of the huge energy down in the Earth. Our well test filled the whole Soufriere valley with roaring steam that made the ground tremble and split ears even with sound muffs on. This Icelandic display, will hopefully make us ponder. There is so much to ponder, so much, and, we are lucky to have just a simple display to remind us, after many years of Earth tranquility except for hurricanes and earthquakes, at just how potentialy potent, Mother Earth can be. It is a warning from her, not to be complacent. Yet such a warning will go unheeded, no doubt. The earth travels around the sun at around 107,000 klm an hour. Its some thing like 5 or six times faster around the milky way. Expect the ride to be a little bumpy along the way. Humans are nothing we are owed nothing just like all other forms of life on earth. Smile have fun and be nice to each other. I’m taking an Astronomy class and we were just looked at a photo from that same volcano. It was a crazy photo! Preet: the effect on weather patterns is not likely to be significant – no marked cooling effect or change in rainfall, for example. There wasn’t enough ash for that. Remain: commercial jets don’t like the thicker air and variable winds at lower altitudes. Yogathirst: thanks for the link. Songbird: given recent events it seems you may be on to something. Colin: I agree with you. NANsee: The lightning picture is incredible. There have been so many great images from this eruption. I find all of this just plain weird. Whoever thought half the world would be talking about a volcano? But then, maybe it’s a wake up call. The world is not under the control of humans. Isn’t it kinda creepy that all of these natural disasters are happening with in just the last few months…? Creepy it is…but the CO2 and climate change discussion just got back on its feet again. The earth is not controllable by humans.